We have plenty of friends that love football, and we all know that an intense football game can make a grown adult wail and cry louder than a kid who dropped his ice cream. You may be wailing even harder if you can’t find a decent bar that screens the match, but don’t worry, we’ve got you covered. 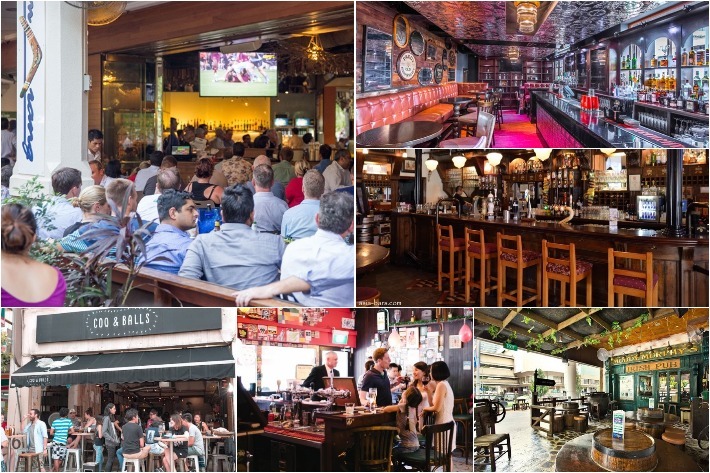 We have here a list of 12 bars in Singapore where you can watch the match with other fellow football fans. 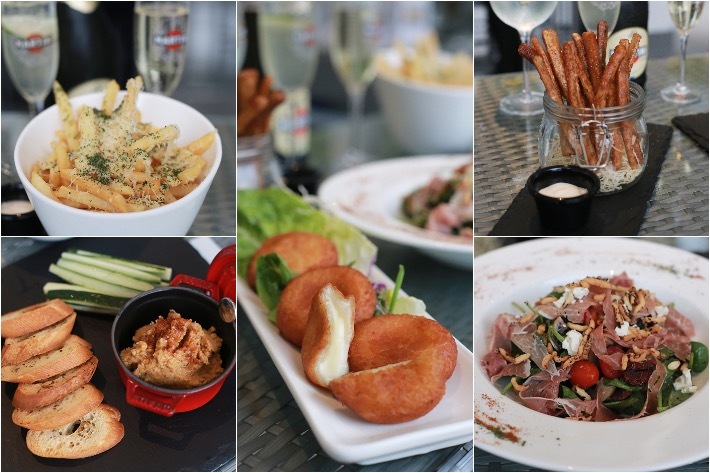 Even better news, these places sell great food and drinks too! Gone are the days when bars used to be after-work hangs for working adults to either drink to celebrate or drown their sorrows. Now, many newer and hipper bars have adopted several fun elements to heighten the overall experience—fun in the form of arcade-style games as well as party games that involve a lot of drinking. Replacing the now defunct Beer Market—just across the street from Liang Court—is one of Clarke Quay’s newest and most fun-filled beer pong-focused sports bars, PONG Singapore. Established only this year, this luxurious drinking hole impresses with its array of beers on tap, hand-crafted cocktails, fusion-style food and their top-of-the-line, digital beer pong tables. 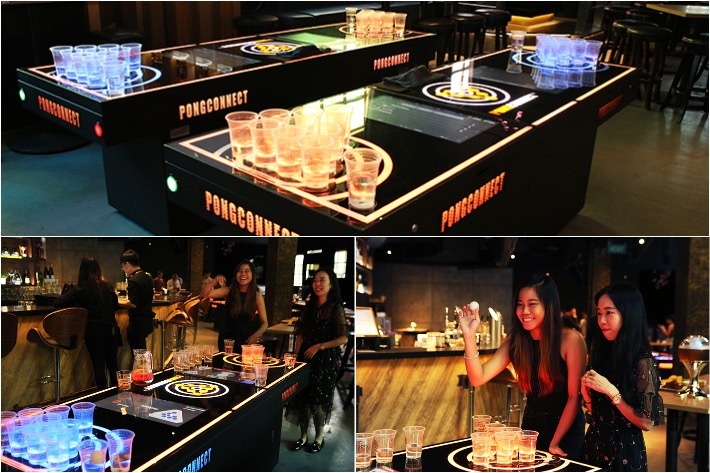 Singapore’s pioneers of the latest PongConnect™ technology, PONG Singapore revolutionises traditional beer pong with more fun, enjoyment and friendly competition. Coming straight to you from Hong Kong, PongConnect™ is the latest trend hitting the nightlife scene all around the world. Not to mention that the features include live scoreboards that not only show your score but connect beer pong players on a global level as well. 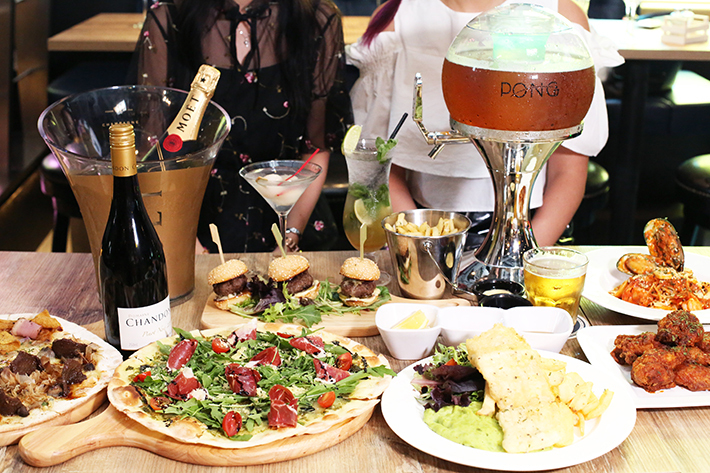 The beauty of the happy hour lies not only in the pleasure of boozy libations but also in the food that is often sinful yet incredibly tasty. 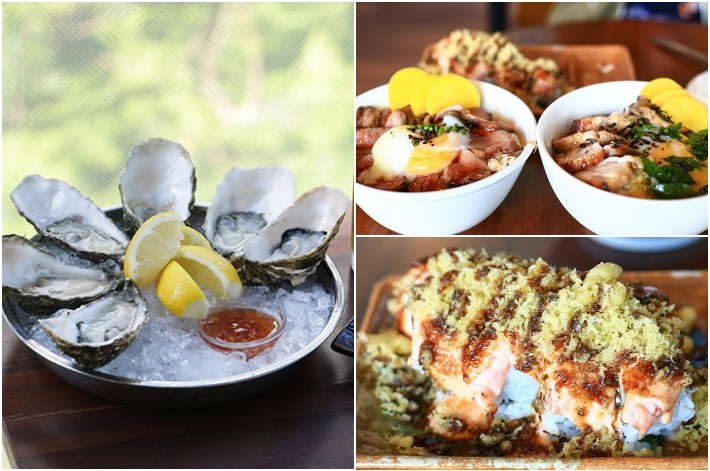 Here at PONG Singapore, you will find no shortage of impressionable nosh. And we will not lie—their food truly takes bar food to a whole new level and is something we will definitely return for. You have to try the Beef Sliders, guys. The 1925 Brewing Co. is a local microbrewery and restaurant that is a passion project from three members of the Yeo family who run the business and food direction of this dining establishment. 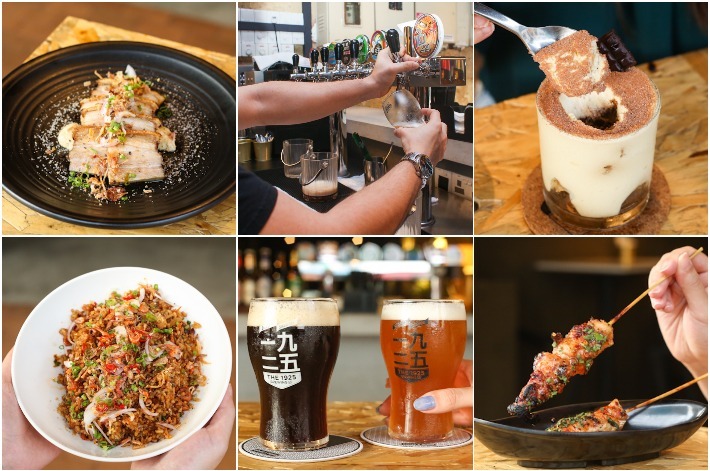 Joining the enclave of established cafes and bars along Joo Chiat Road, the establishment’s second outlet may initially strike you as a simple drinking place where you can get affordable beers but really, it is more than just that. Many hold Tanuki Raw in high regard not only because of their enticing happy hours and their affordable oysters, but mainly because these folks know how to guarantee a fun time through their remarkably innovative grub and tipples. These are the same folks who inspired and more importantly popularised the low-cost Yakiniku Donburi—a heady bowl of sushi rice topped with strips of Angus short rib, doused in a truffle sauce and topped with a wobbly onsen egg. The rising popularity of izakayas in Singapore is no surprise, especially with Singapore’s growing bar scene that sees drinking holes in all forms and themes. An Izakaya is essentially Japan’s equivalent to a Spanish tapas bar where you get to dine and drink under one roof. The answer to the woes of the Japanese working class, Izakayas are seen as a haven where people can go to after work to enjoy a tipple, snack on some food and unwind with their mates. 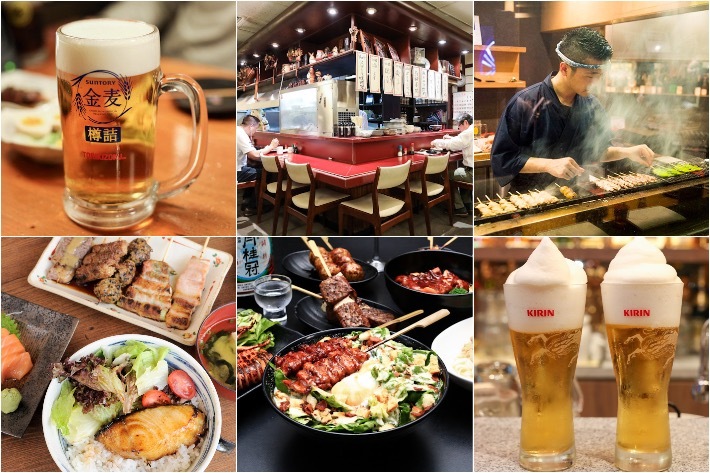 Whether it is an ice-cold beer you crave or something a little more punchy, here are 10 Izakaya bars in Singapore for you to unwind, get fed or simply to drown out your sorrows. Established in 2006, Quaich Bar is the first whisky bar in Singapore which houses more than 500 whiskies, of which 95% are sourced from boutique distilleries in Scotland. It is quintessentially a heaven on earth for all whisky lovers. Many of the whiskies are also exclusive to Quaich Bary and they cannot be found anywhere else in the world. The owners of Quaich Bar take pride in sourcing for the best whiskies from around the world. These one-of-a-kind whiskies should be enough for you to pay this sleek bar at South Beach Avenue a visit!